I would tell anyone to buy one of these, and I would buy again. But Suzuki is pulling out of North America and will be gone within the next three years. 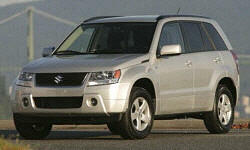 Why the 2006 Suzuki Grand Vitara? Even though this SUV is now seven years old it still looks new. The leather up front is showing wear, and the steering wheel leather has worn away in commonly placed hands. The seats are not designed for drives over five hour trips. Including the back seats. Leg room in back is O.K. for daily life if the passengers are not over six foot. Long trips are very uncomfortable, back there. I know when we bought the SUV, many reviewer's said it was under powered. The 2.7 V6 works well with the 5sp. automatic all wheel drive full time. The same SUV now can only be bought with a 4cyl. Now that is under powered. We never had any major repair or overly costly repair. The only thing that has been a repeat problem, is the transfer case seals have replace twice. The transfer case itself has been rebuilt once. For an SUV with all wheel drive full time and a small V6 fuel economy isn't bad at twenty miles per gallon. we didn't go with the Nav system. But the audio system was very nice. The sub woofer under the driver's seat worked well, till about two three years ago it stopped working. We unplugged it, the rest of the speakers work well without it. We never looked into the cost to replace the woofer. My wife loves the Suzuki's driving position and the height. Why Not the 2006 Suzuki Grand Vitara? It's a SUV, not as harsh as a Jeep. The Suzuki's ride is firm and can be bouncy at times. But using the truck every day, one gets use to it. The tires that came with the truck were the best. Can't seem to find them anywhere. Cargo can be tight when the rear seat is left up. When folded down there is more usable space. The seats can be tumbled forward behind the front seats backs. You don't get a flat floor. Anything over six feet long wont fit inside. Towing is limited to 3300 pounds.